Check out those lucious ‘fruits’! I think they look so pretty. Too pretty to eat in fact. What do you think it’s made of? No, it’s not icing sugar. The colour looks so perfect – but trust me, it is edible. If you guessed marzipan, you’re right. 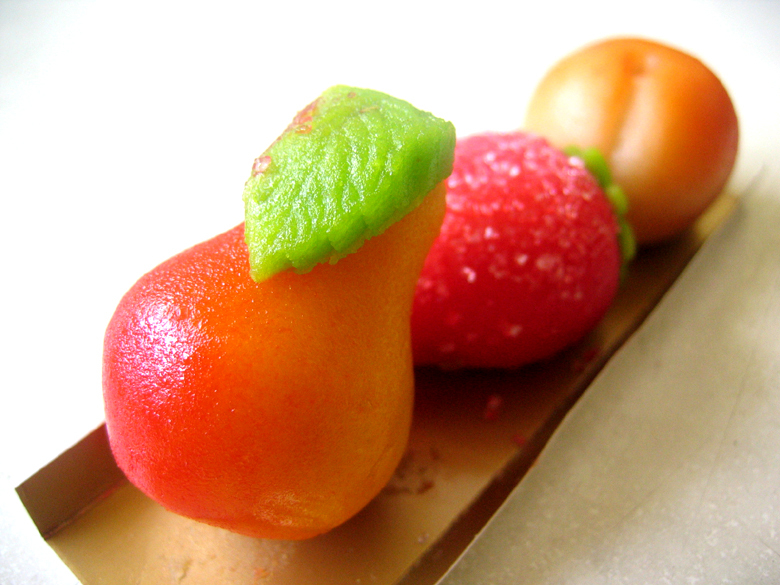 🙂 You know, I’ve never really thought much about marzipan and always stayed away from it because they’re known to be extremely sweet. I think of it as icing on wedding cakes, sugee cakes etc. But recently I tried these and was quite surprised. The marzipan wasn’t too sweet and I could taste the almond quite easily. Haha, can you guess what that is? I think it’s rather easy but I will give you all the benefit of the doubt! Now that you’ve said it’s easy to guess what that thingy is… I’m afraid to take a guess… because I really have no clue. I’m so curious to know the answer! This looks like the Chinese New Year honey-comb cookie/biscuit. Guessing only. You are baking ? OH! I saw these marzipans at Marks and Spencer Raffles City. One tray of I don’t-remember-how-many costs $19.90. Really pretty to look at! Russia, Russia! Does your cousin speak Russian? I’m crazy about all things Russian… including those cutesie little things u showed! First time looking at your site! My guess is that it is a ravioli press. You roll out the dough, fill each “cup” add another sheet of dough and roll over the whole thing with a rolling pin and voila’ ~~ ravioli! Can’t wait to read further. those marzipans are quite lovely! it looks like a silver bee hive! it has bits of flour on it and with the help of earlier comments and google.. i suspect Pacific College Mom nailed it! tigerfish: nope! haha it’s not it. yvonne: yea they too good to eat right? I haven’t tried the ones at Marks and Spencers though. callen: yea, he had to learn Russian. he’s still there. i should really go visit ya! i wanna eat authentic russian food…. Pacific College Mom: you’re sharp! 🙂 yea, it’s actually a Russian version of the ravioli press. They call their ‘ravioli’, ‘pelmeni’. It’s about the same thing… just a different name, and shape! I lived in Kyrgyzstan (a former Russian province) for a year and had many a pelmeni. Delicious, especially with smitana (sour cream). I actually have a picture of me making them, but we didn’t have one of these little contraptions. We cut our little dough rounds with the tops of small drinking glasses, folded the dough over the meat filling, and turned the ends together. Yum! 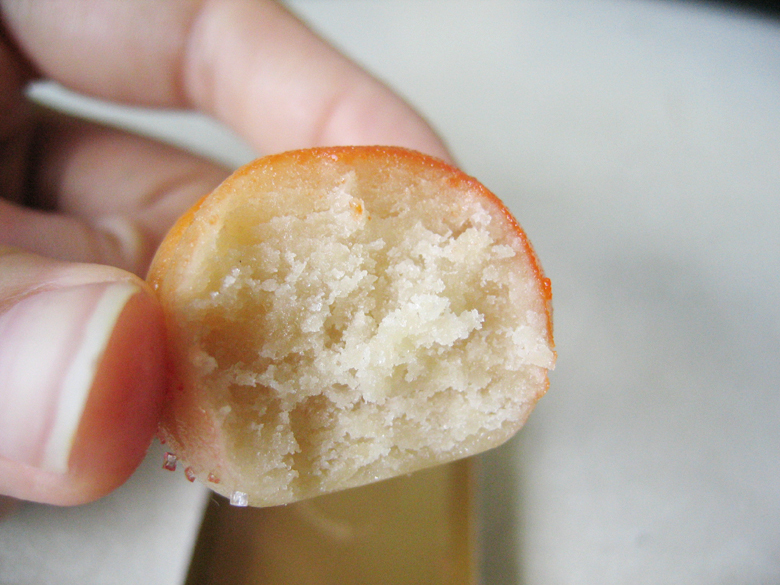 Many thinks marzipan is sickeningly sweet and it isn’t really popular in Singapore. But that’s cos the local ones are horrid. You need to try those made-in-Europe ones. I had such great marzipans in Austria and Belgium. Those are fabulously scrumptious. I know what it is!!! We just returned from a trip to Germany where we stayed with my aunt near Celle. She spent nearly 30 years after the war in Russia. 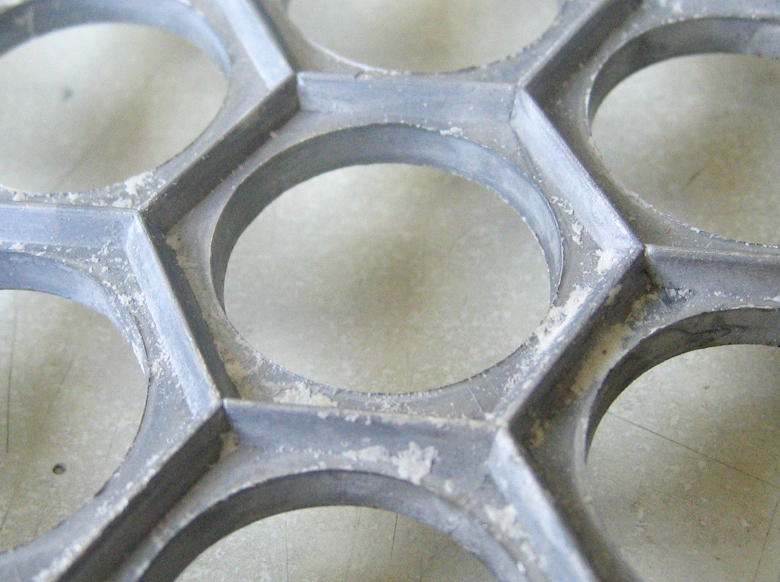 We searched all over Berlin looking for a Pelmeni press and found one the day before we left. Pelmeni are the Russian version of ravioli!